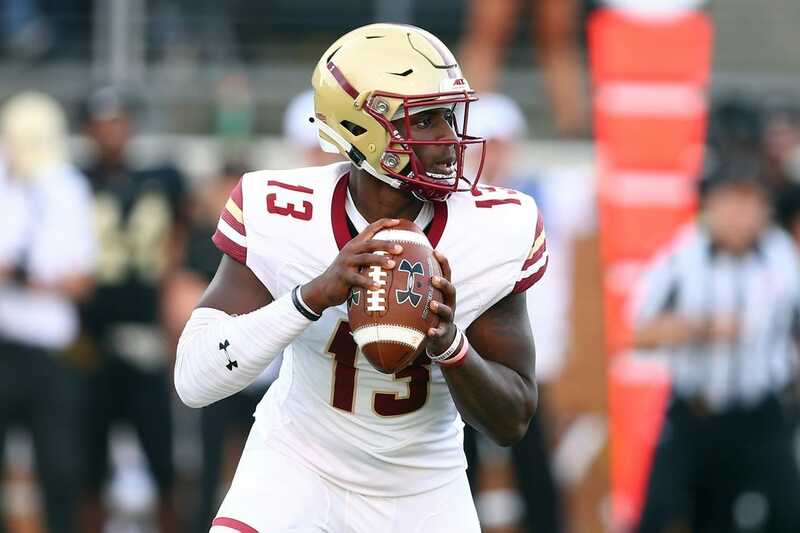 Boston College quarterback Anthony Brown threw five touchdown passes as the visiting Eagles defeated Wake Forest 41-34 in the Atlantic Coast Conference opener for both teams Thursday at BB&T Field in Winston-Salem, N.C.
Two of Brown's scoring strikes went to Jeff Smith, covering 27 and 71 yards. The latter came in the fourth quarter after the Eagles had taken over at their own 8-yard line while holding a 28-24 lead. Hartman's touchdown pass to tight end Jake Freudenthal for 5 yards with 1:33 remaining gave the Demon Deacons a chance, but Boston College recovered the ensuing onside kick. Wake Forest (2-1, 0-1) tied the game later in the quarter on Colburn's 2-yard lunge into the end zone. Wake Forest took the lead later in the second quarter on Sage Surratt's 5-yard touchdown catch from Hartman. Three plays later, Boston College was in the end zone again on Brown's 35-yard pass to Kobay White for a 21-21 score at the break. The Demon Deacons opened the second half with a 75-yard drive that resulted in Nick Sciba's 27-yard field goal. However, Brown's 29-yard pass to tight end Tommy Sweeney gave the Eagles the lead on their next possession. Wake Forest drove 86 yards on 15 plays late in the third quarter but came up empty when Hartman's pass on fourth-and-2 fell incomplete.